When Elizabeth traveled up to NY to pick up her latest barn loom, this was included. The former owner was told it was part of the loom. It appears that it was used to "lift" something. It stands 30 inches tall and is 28 inches wide. The "front" feet are 13 inches long and the back feet are 7 inches long and the full width measurement of the feet is 27 inches total. The large beam in between the legs is 4 inches wide, 3 inches tall and 33 inches long. 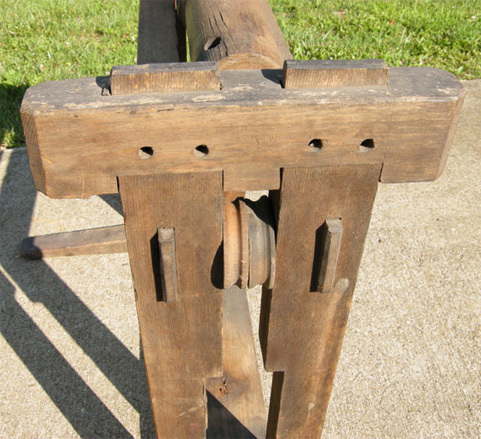 It has witness marks of two attachments to the top of the moveable beam with pulleys. A rusty square nail protrudes from the top. The legs are 2 inches by 2 inches square at the bottom and increase to 3 inches wide at the top. A eight pulleys are about 2.5 inches in diameter. One theory as to how it worked is to attach a rope from the top roller, through the pulleys and finally attaching to the beam. The large holes in the center of the roller line up so a dowel the size of a chair leg can turn the roller. 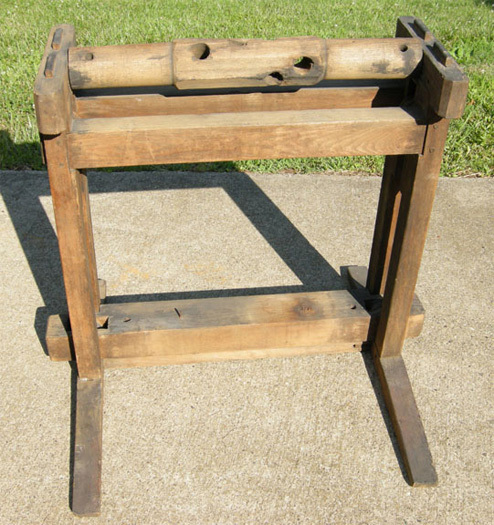 Note: This item was donated to the Heritage Farm Museum in Huntington, WV. 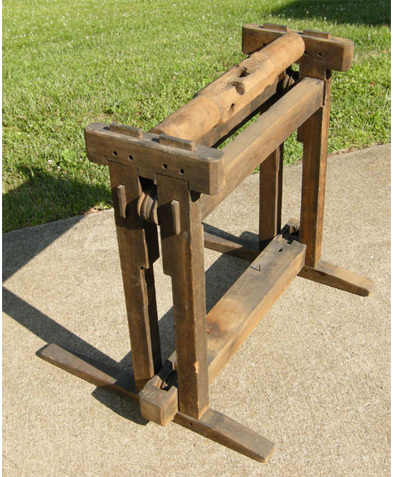 Mr. Possum Jim, I believe this device would have been used in a sawmill to lift beams for sawing, it would take two of the devices to lift a beam to feed a saw. I recall seeing a post and beam house here in Georgia, 12"X18" beams with mortise and tennon construction. The mechanics of this machine uses a double block pully arrangement, thereby doubling the lifting power of the device. I am guessing on what this is, but it seems logical. 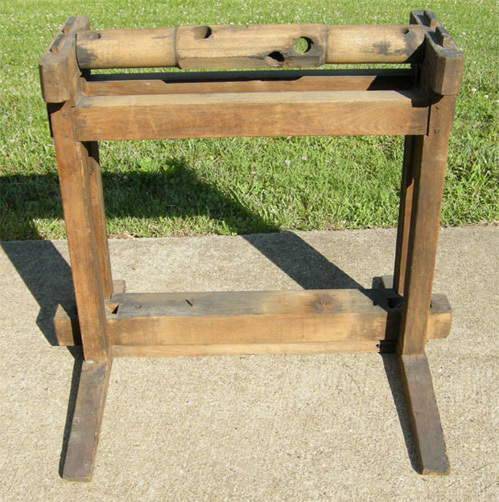 Have looked at this and if it is part of the barn-loom accessories, I believe it could be a press for baling the greige cloth. The cord passes from the bottom press over the worn pulley, down, up, down and up to the windlass. The 30" height seems correct for winding and the longer foot on the one side would help resist the torquing of the windlass.